Michael Pollan is an award-winning journalist, a prolific author, a professor at the University of California Berkeley, and a fierce and tireless advocate for sustainable living. An internationally renowned speaker, Pollan has been called an "ethical-eating guru" (New York Magazine). He was named to the 2010 TIME 100, the magazine's annual list of the world's 100 most influential people. He is one of the most compelling and influential voices of our time, and a thought leader on many subjects, including food, agriculture, the environment, health and public policy. We caught up with Pollan recently for a Q&A. You're an accomplished historian. What lessons from the past are influencing your work right now? I've always taken an historical perspective on anything I'm writing about. Learning the history of something often explains why it is the way it is. Too often we assume that things have always been the way they are. Nothing is inevitable in history. There are always a series of actions (or actions not taken), events and contingencies that shape things. History often provides answers. Let's talk about water. Governor Jerry Brown has announced mandatory water restrictions for the state of California. What might the future hold for California and agricultural production in the state? It's about time. The pressure for changing the current water arrangement is going to be fierce. Right now agriculture claims about 80 percent of water in the state, yet it contributes only a tiny fraction of the state's GDP. Politically, this is not a sustainable place for agriculture to be. However, much of the low-hanging fruit in reducing consumption is in agriculture. There are so many ill-advised uses of water in agriculture today. If water were priced to more fairly reflect its preciousness, I think you'd spur a lot more innovation in agriculture. Something like 25 percent of the water goes to growing alfalfa. That's not anything anyone can eat, and a lot of it goes to China. Is that the best use of California's water? And then there are almonds, which require a great deal of water. Cattle production (for meat or dairy) is also water-intensive, and you have to ask, is a desert the best place to raise cattle? We need to take a good hard look at where water is being used, how it's being used and on what crops. That's not to say that urbanites don't have a role to play. They do. The low-hanging fruit here is the acreage devoted to lawns. I've been working to dismantle lawns for decades, even when I lived on the very wet East Coast. Even then and there it didn't seem like a good use of resources. Now that the governor has announced restrictions, we're going to have a conversation about water, which we've been avoiding. But it's time. Sooner or later this conversation had to begin. Now it will begin in earnest. That's probably a good thing. Growing food is a very good use of water, but we have to ask ourselves: "What kind of agriculture?" The drought is one thing. It's really something to worry about. We had a little preview last weekend of that in Berkeley, when our tap water started tasting terrible. They were apparently taking water from a warm part of the reservoir. There's less water, and the remaining water is getting warmer. The drought and its impacts are going to affect us all really intimately. I garden, and I'm getting ready to plant the vegetable garden. Should I plant it or turn the irrigation off and take a year off? Am I more efficient with water growing my dinner than Full Belly Farm? I have no idea. What also keeps me up at night is whatever my current writing project is. What might it take to get the next generation inspired about food policy? I think they already are inspired. One of the things that strikes me when I'm teaching food politics is that students are intensely engaged by the subject. If you've been watching the Edible Education 101 class, you see it. They realize they can make a difference in an area that offers a lot more hope than many issues, including climate change, which seems somewhat hopeless. If you're dealing with food politics, you're seeing positive change all the time. These students are hungry for information, hungry for direction, and are exploring how and where to inject themselves in the food system. Should they learn to be a farmer, a policy maker or engage in writing as a journalist? They're exploring these ideas. On the importance of food policy and its ability to serve as a lever for change? They get that already. I'm giving you a super power. You can change one thing about the food system with that super power. What change would you make? The big change that needs to happen is that we need to replace the fundamental energy source of our food system from fossil fuel to sunlight. If I could do that and squeeze 90 percent of the fossil fuel out of the system, and return it to a foundation of sunlight – where it has been before and can be again – I'd do that. What must institutions do to effect change in the food system? The first step is to become a model. Do it right themselves. Figure out how to source food in a sustainable way, reduce the carbon footprint of their supply chain, and pay their food workers a living wage. Show that it can be done. Universities should make their own food systems sustainable and just. Once you've done that, you have an enormous moral authority to pronounce on what needs to be done, and how it can be done. The second step is to make food and food politics available to students as an area of study, whether as a minor or major, to raise the profile of the issue and educate people about it. That's something universities are good at. There's something especially interdisciplinary about food issues; they touch almost every academic discipline in one way or another. Food issues also cross the sciences and humanities, which makes them an excellent vehicle for advancing the entire idea of interdisciplinary study. Studying food issues offers both opportunities to universities and obligations. You've advocated for a coherent national food policy. What will it take to make that a reality? Well, it could happen a couple of different ways. One way would be if there was a lot more grassroots activity around the issue. It may be that what we need first are more local, municipal and statewide food policies. Bringing change to Washington, D.C., is very difficult. Another way it could happen would be having a president who makes it a priority or by injecting it into the 2016 presidential campaign. In the same way candidates are driven to make promises about other issues, such as abortion rights and immigration, we need to start demanding that candidates have policies and make promises about food and farming issues—and not just farm state candidates, either. There may also soon be powerful pressure from the health care industry, the military, and also possibly parts of the government concerned with things like climate change and the environment more generally to rationalize agricultural policies that are undermining all those interests. Right now we have farm policies that actually undermine our environmental objectives on climate change. Current farm policies make it hard to cover health insurance costs, because so much of that spending goes to treat chronic diseases that are a result of diet. And it's become more difficult for the military to find recruits who meet health and weight requirements. These groups are gradually coming to the recognition that our agricultural policies and the rules that organize the food system are undermining their needs. And that may lead them to push to rationalize and change these policies. Those are the three things I see right now that could lead to a national food policy. We're faced with challenges on a variety of fronts that have strongly ethical aspects to them, such as climate change, environmental constraints, income inequality, and food access. How do we get groups to move forward together? And is this a movement? It's a very chaotic and inchoate movement. There are many different groups with different agendas. They may not always care that much about the interests of others. We're all in the same movement, but it's a little different than other movements, because the interests are so diverse. We need to find issues that unify people. 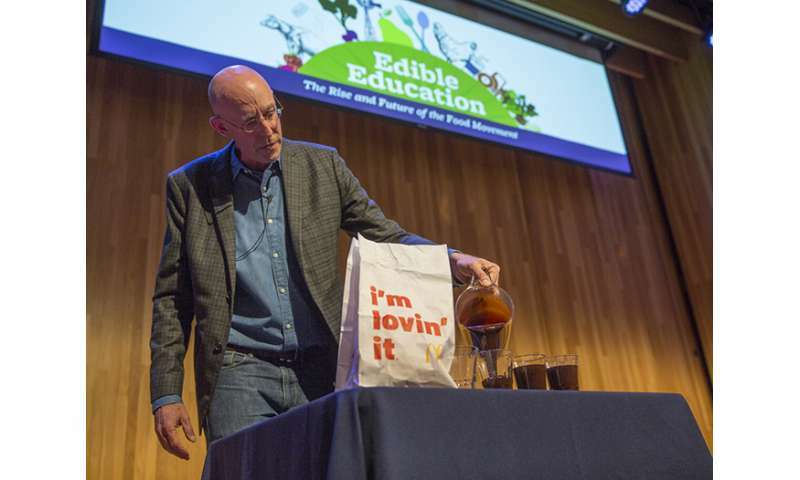 We (Michael Pollan, Mark Bittman, Ricardo Salvador, Olivier De Schutter) put forward in The Washington Post last winter an op-ed piece that proposed a national food policy idea. The response to the piece demonstrated that feeding everyone healthy food and providing a living wage for workers in the food system is something everyone can get behind. Working out the details and emphases might bring disagreement. So a starting place might be having the creation of a national food policy as a goal and pushing for it. It had a lot of support, and we gathered a lot of signatures; there was not a wing of the food movement that didn't sign on to it. That suggests that this might be a place to start. And it needs to become a White House priority, just like national security, environmental policy or health policy. Diet change – a solution to reduce water use? Intelligence can save us, politics can kill us. Politics is driven by Big Money. When the govt is in charge of food, people starve. Not surprising, not one word about how free markets promote food quality and quantity. The data is there, but it doesn't fit the socialist agenda of controlling the lives of others. "free markets promote food quality and quantity" ... "the data is there" ... "socialist agenda"
It's great that Pollan is emphasizing (farm) food policy and building the movement. His value are in the right place. A key problem with Pollan (and his course on food,) is that he misunderstands the Farm Bill. We see that in the Washington Post piece on the need for a "National Food Policy." He calls for subsidy reform, but that misses the bigger issue of injustice against farmers, which is at the root of many of the problems (i.e. leading to cheap farm prices, cheap food, cheap corn, cheap sugar and transfats, cheap feed for CAFOs, export dumping of cheap grain on poor farming countries). (See "National Farm AND Food Policy, Response to Bittman et al") The problem is the absence of living wage price floors, not the presence of subsidies. The Movement can never win if it unknowingly supports the problem. We need Price Floors, (like we had in the past, with no need for any subsidies,) because 'free' markets don't self correct, as abundant evidence shows. So ryggesogn2 is wrong. because 'free' markets don't self correct, as abundant evidence shows. New Zealand is a fine example. A price floor IS a subsidy. Guaranteed prices to farmers incentive farmers to overproduce and benefits farmers who have low costs.